You will have the first opportunity to view the final release of spectacular suites and receive special promotions and incentives. 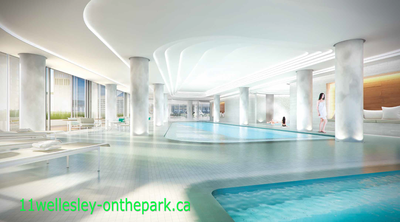 Right in the heart of downtown Toronto at 11 Wellesley st west, Yonge & Wellesley you can find 11 Wellesley Condos. 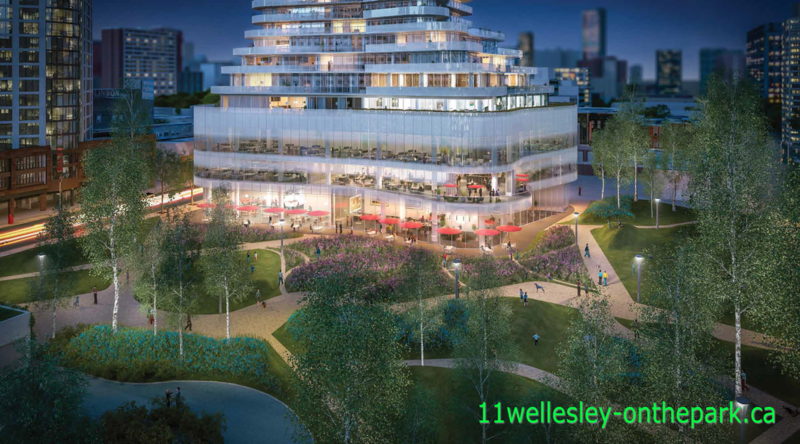 11 Wellesley is a simply amazing setting and it doesn’t really get any better than that. Living in the centre of the city gives you limitless occasions to shop, dine, and visit art galleries and the theatre, not mentioning the education opportunity part. Wellesley subway station is only one minute away and both University of Toronto and Ryerson University campuses are within walking distance. Lanterra Developments got this 2.1 acre piece of land, which was sitting unoccupied for over twenty years, for $65 million dollars last February. Initially they have planned to build a 1.6 acre park with only one condo tower and 681 units, but in the end they decided to give the local residents some Green Space which was much needed in the area. A remarkable landscaped park is going to be attached to the tower which will turn the whole structure into a stunning natural retreat. This metropolitan park will be stretched across the entire block and the landscaping will include only native species of trees and bushes plus a large number of walking paths, rural seating, arbours and flowerpots. This is going to be something that was never seen before in downtown Toronto! 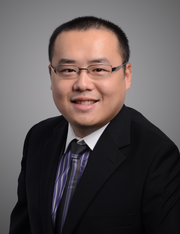 The park will be surely providing unique experiences to both residents and visitors. Below the tower, at a street level you will find a remarkable podium which will include a mesmerizing range of retail stores. 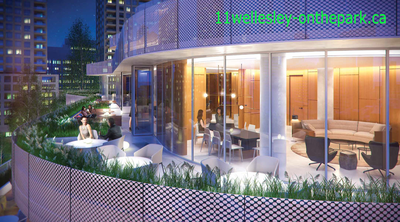 On the higher levels there will be offices, together with a thrilling selection of lifestyle facilities for residents. At 11 Wellesley you will find an amazing range of suite plans – anything from contemporary studios to roomy 3-bedroom developments. This stunning project is situated in the middle of the city buzz. Even the way to 11 Wellesley condos is a unique experience. On arrival you’ll see a grand curving porte cochere driveway under an inspiring canopy of elegant stone and shiny columns. You’ll go through a tall glass swivel doors before you’ll get to the lobby which is full with sophisticated finishes. Nature is where it all starts but it progresses into something different and one of a kind. 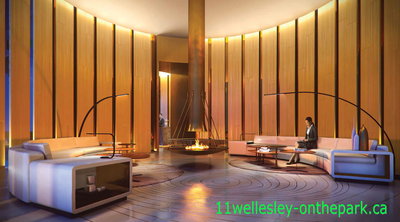 11 Wellesley condo has a fresh metropolitan aesthetic and the splendid lobby is showing exactly that. The décor of the lobby was inspired by nature’s plants, rocks and other but it changes into a clean and splendid atmosphere filled with geometric forms and organic shapes. Optimistic, full of light and roomy with a double-height ceiling, 11 Wellesley’s finishes are demonstrating the dream of assimilating nature and life. 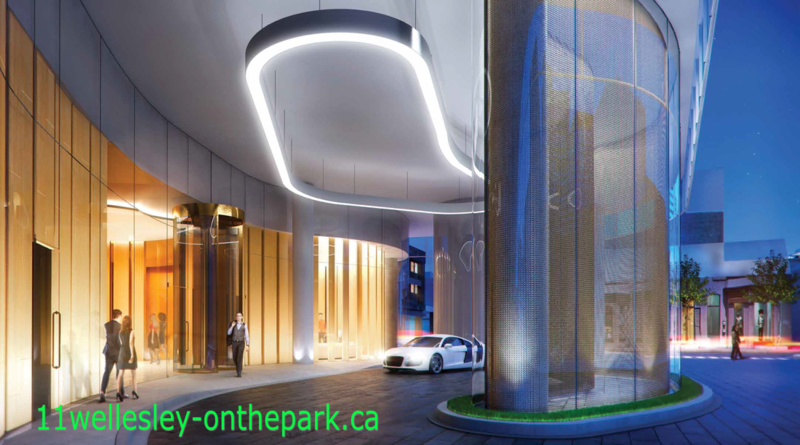 When it comes to 11 Wellesley Condos Facilities, the tower is situated on a multi-level, mixed use podium where you will find a variety of retail stores, offices and building services. The culmination of all of this can be found on the 5th floor rooftop terrace which only residents have exclusive access to. Animated patios and storefronts will surely alive the Wellesley streets peninsula with new energy. This is where you will align yourself with the pulse of downtown. 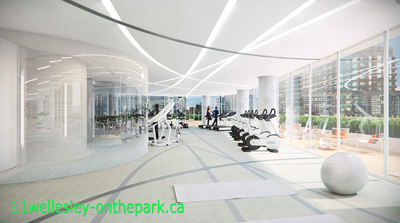 The tower sits on a multi-level, mixed use podium that will house a fine selection of retail stores,offices and building amenities, culminating in a marvelous 5th floor rooftop terrace exclusively for residents. Vibrant patios and storefronts will animate the Wellesley streets cape with new life and vitality. This is your front-row seat to the pulse of downtown.